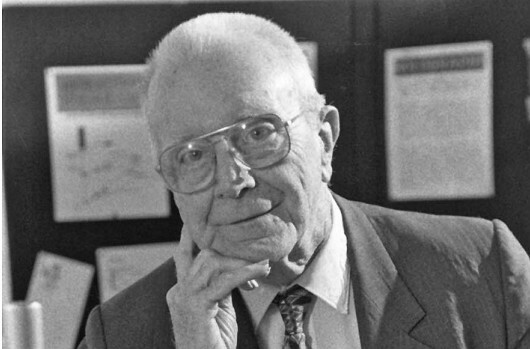 M. Parker Givens, former acting director and professor emeritus of the University of Rochester’s Institute of Optics and a renowned teacher to generations of students, died peacefully on Jan. 11, 2013 at age 96. Givens was a professor at the University since 1947. Although Givens “officially” retired in 1981 at the mandatory age of 65 (at that time a federal law), he continued to teach for another 22 years, being primarily responsible for the senior laboratory course. Givens credited the high caliber of his optics students over the years with providing the push to constantly expand and deepen his knowledge of the field. A native of Richmond, Va. he graduated in 1937 from the University of Richmond. 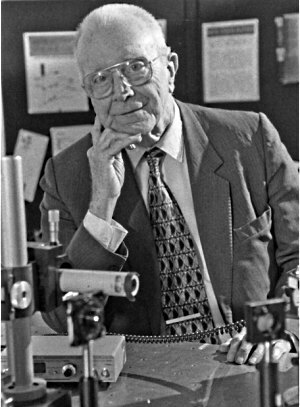 Givens received his Ph.D. from Cornell University in 1942, where his fields of interest were the optical properties of metals and vacuum ultraviolet spectroscopy. After his Ph.D., he became an instructor of physics at the Pennsylvania State College from 1942-46. Prior to joining the University of Rochester he also spent a year with the proximity fuze group of the Johns Hopkins Applied Physics Laboratory. During his time at the University he also served as Acting Dean of the College of Engineering and Applied Science in 1984-1985. Along with former director Robert Hopkins, Givens received a 1963 NSF grant to develop new teaching experiments and demonstrations using the then newly developed optical laser. Hopkins, Givens and others equipped a traveling unit – thus the origin of the “laser road show” – that was taken to several universities and an NSF institute for high school teachers. A 1963 visit to Nantucket, Mass., resurrected a childhood fascination with bees, and he kept bees for the next 30 years. Each season, Givens harvested several hundred pounds of honey, most of which he used himself or gave away at the Institute. He is survived by his daughter Jean F. Givens of Lexington, Ky. He is predeceased in 1979 by his son Robert P. Givens, in 1989 by his son R. Wayne Givens, and in 2007 by his wife of 65 years, Gene M. Givens. The University will be lowering the flag on Jan. 16 in honor of Givens. He will be interred in Crewe, Va. A memorial service will be held at Community Christian Church, 2647 Chili Ave., on Wednesday, Jan. 16 at 5:30 p.m. A reception will follow. To share a memory of Givens or to send a condolence to the family visit www.anthonychapels.com.